The circuit of a continuously variable regulated power supply employing negative feedback is shown in Figure. The unregulated dc supply is fed to the voltage regulator. The circuit maintains constant output voltage inspite of variations in load or input voltage. T1 and T2 are the two transistors connected in the circuit, as direct coupled feed back amplifier. In this circuit the output voltage variations are returned as feed back to oppose the input changes. The base of transistor T2 is connected to the variable tap of the potentiometer R3. Supposing the output voltage increases by any reason, it causes an increase in the voltage across the P & Q points, which is the part of the potential divider, consisting of R2, R3 and R4. This raises the base emitter voltage of the transistor T2. This increases the collector current of T2 and most of it flows through R1. This makes the voltage at the base of T1 to decrease. This low voltage on the base emitter junction of T1, tends to decrease the output voltage, resorting it to the original value. The reverse will happen if the input voltage decreases. The zener diode is used for providing a reference voltage and the difference is amplified by the transistor T2. The potentiometer R3 serves as the voltage controller. The output can be made to vary from zero to the maximum by varying the potentiometer R3. The Circuit Diagram of Transistor Series Voltage Regulator is shown in the circuit below. Also Working is explained. 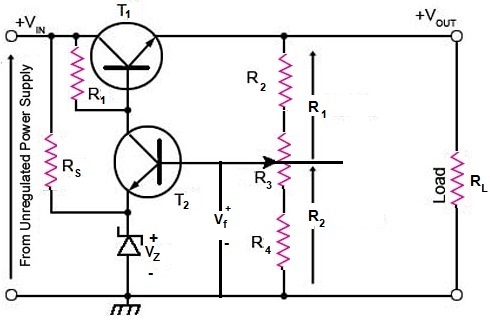 The Transistor Series Voltage Regulator Theory is explained as follows. From the circuit of Figure, we can observe that the feedback voltage VF, is the voltage developed across the part of the potential divider P & Q. If we represent that resistance by Rf, the feed back fraction will be, Rf/(Rf + Ra) where Ra is the part of the potential divider R & P as shown in figure. The closed loop voltage gain of the transistor T1 is proportional to the reciprocal of the feedback fraction. Considering the closed loop of the Zener diode which is the reference, the base emitter junction and the part of the potential divider, the sum of the voltages must be zero. Where, Vout is the regulated output voltage. A' is the closed loop voltage gain. VZ is the zener voltage. Normally the series regulator uses a power transistor as its series transistor. This transistor must be capable of withstanding the power dissipated during full load current. A proper heat sink is to be provided. The power dissipation is given by the product of the collector current (load current) and collector to emitter voltage. When heavy load currents are expected, power transistors may be connected in darlington pair to act as the series transistor for the regulator circuit. This enhances the power handling ability of the regulated power supply of this type. Though the series regulator type regulated power supply works satisfactorily, it has the disadvantage that it has no short circuit protection. In any regulated power supply or in ordinary power supply the series diode will carry the load current. Accidental short circuiting of the output terminals or over drawing of current from the power supply leads to the excessive dissipation of power in the series transistor or diode, resulting in the destruction of the transistor or and the diode of the power supply circuit. To prevent the destruction of the series transistor or the rectifying diode when accidental short circuit occurs or excessive current is drawn, we have to incorporate a current limiting device. When such a device is incorporated we call the circuit to be consisting of short circuit protection. I can understand the different components but fall short in understanding how they work together.